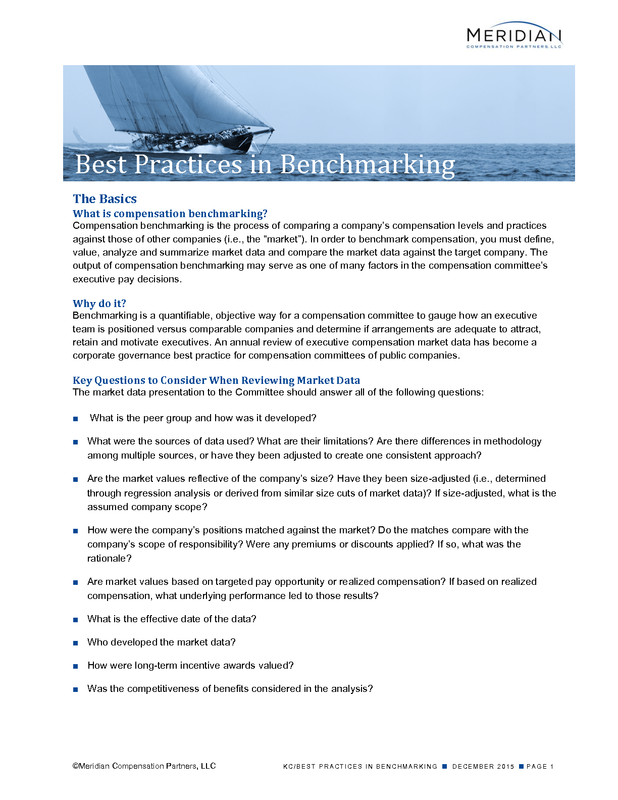 Compensation benchmarking is the process of comparing a company’s compensation levels and practices against those of other companies (i.e., the “market”). In order to benchmark compensation, you must define, value, analyze and summarize market data and compare the market data against the target company. The output of compensation benchmarking may serve as one of many factors in the compensation committee’s executive pay decisions. Benchmarking is a quantifiable, objective way for a compensation committee to gauge how an executive team is positioned versus comparable companies and determine if arrangements are adequate to attract, retain and motivate executives. An annual review of executive compensation market data has become a corporate governance best practice for compensation committees of public companies. What is the peer group and how was it developed? What were the sources of data used? What are their limitations? Are there differences in methodology among multiple sources, or have they been adjusted to create one consistent approach? Are the market values reflective of the company’s size? Have they been size-adjusted (i.e., determined through regression analysis or derived from similar size cuts of market data)? If size-adjusted, what is the assumed company scope? How were the company’s positions matched against the market? Do the matches compare with the company’s scope of responsibility? Were any premiums or discounts applied? If so, what was the rationale? Are market values based on targeted pay opportunity or realized compensation? If based on realized compensation, what underlying performance led to those results? What is the effective date of the data? Who developed the market data? How were long-term incentive awards valued? Was the competitiveness of benefits considered in the analysis? Confirm benchmarking objectives. Establish a shared understanding of the desired objectives of compensation benchmarking. This will help ensure that the outcomes meet the committee’s needs to make pay decisions. Ensure the peer group is appropriate. An effective peer group should, to the extent possible, represent the types of companies that a company competes with for executive talent (i.e., companies it attracts talent from and loses talent to). However, it is also important that the group consist of organizations of similar size, industry and complexity. Review compensation levels every year for senior executives. We suggest conducting market benchmarking on an annual basis at a minimum for the CEO, and typically for the proxy named executive officers. In response to a myriad of internal and external factors, executive compensation levels and design are constantly changing and evolving. Annual benchmarking ensures that the compensation committee has the most recent available facts when considering pay decisions. Review all elements of total direct compensation together. We suggest that compensation committees request a review of each component of pay (base salary, annual incentives and long-term incentives) and total direct compensation against the same comparator group to provide a complete picture of executive pay. Report summary statistics on the middle 50% of the market data. We suggest that compensation committees review market data that represents the middle 50% of the market—the 25th, 50th and 75th percentiles, each preferably size-adjusted. This will show a full representation of the market and will demonstrate how narrow or wide the ranges can be. Totals should be shown for each component of pay to show the cost impact of exceeding the 50th If a company targets compensation to be above the 50th percentile, this may be seen as unfavorable to shareholders and/or proxy advisory firms. Request proxy-reported executive compensation data for the CEO and CFO. For the CEO and CFO positions, the compensation committee should review line-by-line pay data at peer organizations. This provides the highest available transparency and credibility in market data results. Have consultants present their own market results.If the compensation committee engages an outside consultant to develop an executive compensation market analysis, the committee should ensure that the consultant is available to directly present the findings and answer questions. This will ensure that findings and observations are presented to the committee in an unfiltered manner.